A special Thank you to Nancy Vickers of Nv Cockers for allowing to have the copyright on the logo of our new website. I can’t say how grateful I am to her for sharing it with me! Marlys Gallager made this amazing artwork for Nancy Vickers over 10 years ago and it was done in ink. As you can see it in different forms the original artist had done a terrific job in creating this. 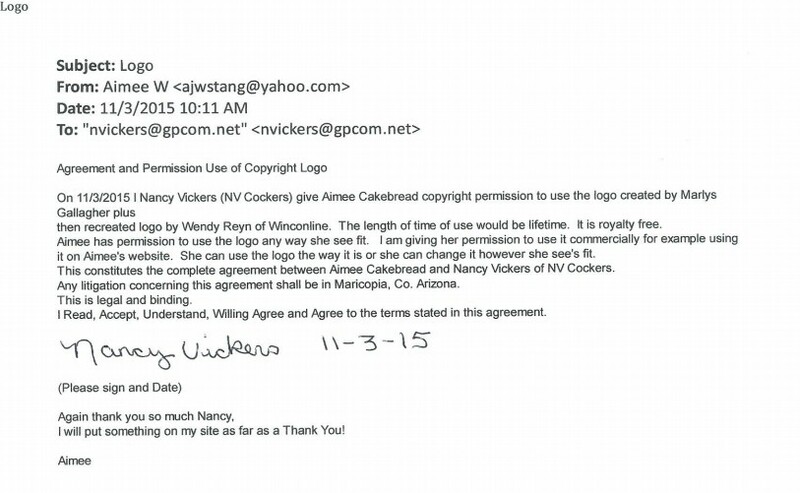 to the logo under state law, and has no issue with the reproduction. All images are property of Cakebread Cockers and are not to be used without permission. All the photos on our website are of our own dogs, dogs that we had before, in our possession or owned by us. Use of their photographs is strictly prohibited without written authorization from us on our Letterhead! If you are using one of my photos without my permission I will go after you. We do host images of past puppies/dogs that are no longer in our possession. Photographs that are taken by us, we have obtained permission to use those images on our website. Photographs taken by owners of our dogs, we have also obtained permission to host these images. We use them solely to show the progress we have made in our breeding program and retain no rights to the dogs. Unfortunately from time to time, people may come to a disagreement as to the proper use of a photograph and we aim to please all of our puppy buyers, and will promise to keep with the practice of using such property granted to us in a respectful way until such time as we are asked in writing to remove the image or content. We do ask for 72 hours for us to have images or content removed. On, my site I include links I will not assume any responsibility for the content of these websites. Additionally, in regards to medical, registration, classified ads, dog food, or other Cocker sites including breeder links, I have not investigated and/or qualified these any organizations. You will need to perform your own check on these organizations, use at your own risk. I the owner of this website attempts to ensure the accuracy of the advice and information contained within this website. Said advice and information is utilized at the full risk of the user. No advice or information shall be construed as a substitute for medical or veterinary diagnosis or treatment, as a guarantee, or as any type of warranty. Note that I am not a Veterinarian, but I will tell you what I have used or done in the past but be aware use your own judgment and at your own risk. I take no responsibility. For a professional opinion please consult a Veterinarian. No portion of this website, text or otherwise, to include, but not limited to, every page be copied by any means, electronic or otherwise. All contents and material contained within this website is protected by copyright laws, and you may not modify, copy, reproduce, republish, upload, post, transmit or distribute in any way any material from this site, including code. Currently our house is closed to visitors due to the recent outbreak of the Canine Influenza Virus, which is currently sweeping across the country. There are many articles stating it is here right in our county. It can be brought in by shoes, clothes, hands, tires on vehicle. Our dogs mean the world to us and because of that you are not allowed here to pick out your puppy. We supply photos and videos of the puppies, photos of the parents and pedigrees. Puppies without a full series of vaccinations are more susceptible to parvo and we are not putting them at risk as well. I have decided to do this because we have had no incidence of this virus here. We vaccinate our dogs with Neopar which is the best Parvo medicine out there! Please if picking out a puppy in person means so much over the health of your possible puppy by all means finds somewhere else to get a puppy from. We love our puppies! I have several images of puppies I have produced and enjoy having them on public display for you to see. I do retain copyright to those images I have taken, but will do my best to use pictures of those puppies in such a way that neither breeder nor owners are violated. 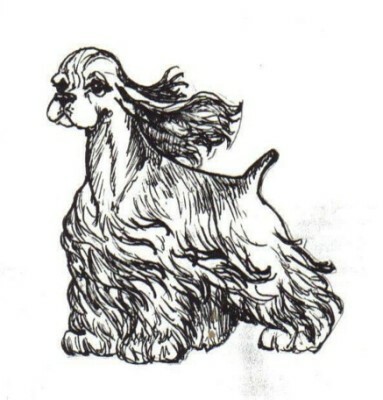 I will from time to time put pictures of past puppies up on my website as an example of my breeding program, should you have an issue with this please discuss that with us immediately, and we will remove them upon request. I will ask you to provide for me, copyright disclosure for legal purposes if you allow me to use either image or email on my website. By sending emails or letters any/all material enclosed such as letters, notes, suggestions and photos such as digital or hard copies you are agreeing that they are now my property and I am able to use them at my discretion and are subject to be used on any or all pages of my website at no charge to me. I try to update my website as often as possible, but with three children and a busy life at times it is hard. Some puppies/adult dogs might be sold. If you are interested either call or email me regarding the puppy/dog that you might be interested in this way you know for sure the puppy that you are wanting is not already taken. If you are interested in one of the puppies please go to Policies- It has a drop down box and read Deposits, Shipping, Puppy Contract and all other contents on the website before sending a deposit. Please carefully read all information about our puppies as we want you to understand all information about purchasing a puppy and all information about the puppies here at our home. Also by placing a non-refundable deposit down you also agree to all terms about our Policies, Deposits and all terms of the Puppy Contract.